It's October which is as we all know the spookiest month of the year. I have something ambitious planned for it as well. Every day in October a new update on this blog! But seriously I can't review a whole book each day when I normally crap one out every 3 or 4 months? No, I can't! What I'm doing is doing a short story each day. 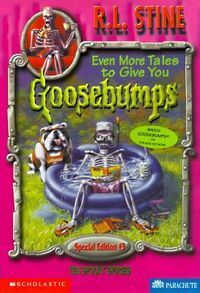 You see back during the original run of Goosebumps he would release about one book a year called Tales to Give You Goosebumps, or, More Tales to Give You Goosebumps, and so on. Each of this had 10 short stories instead of the regular one full one. The first 3 of these books were conveniently collected in a nice hardcover pictured above titled appropriately 30 Tales To Give You Goosebumps. That's one for each day in October plus this nice intro I'm writing. So what is my history with these books? I never even read them! I knew they were out when I was a kid. I saw them on the shelf at the Scholastic Book Fair in school. 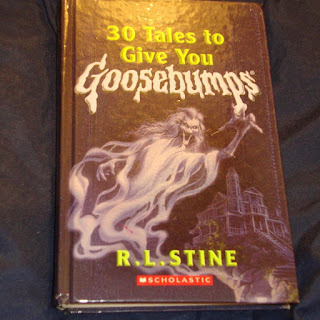 I even recall them coming in editions packed with a Goosebumps reading light! I remember considering purchasing them. Why did I never pull the trigger on that idea? I guess ultimately the idea of one "long" story interested me more than several short ones. What are these stories like? Are they just mini Goosebumps rushed along? Or does he get the chance to play with the format a little? Did R.L. Stine even write these? It's debatable! You see, while he was churning out at least a book a month in his prime he was under contract to not use ghost writers in his Goosebumps book. He claims to not use them, and I wont argue with that. But apparently these "Tales" books didn't count on this contract, so allegedly he was allowed to bring other people in. Did he? Well so far only one author has come forward to claim authorship of one of the stories (in the 4th book, one not included in this hardcover.) It is, however, entirely possible some of these stories were ghost written too. 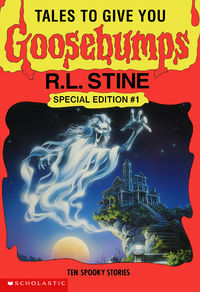 The cover features the ghastly visage of Curly the Skeleton. If you don't know Curly he was kind of a hip mascot for the series. Since each book was a different unrelated story, they didn't have something to tie them all together. How do you try to throw that into marketing? Hip mascot! Since these books were compilation it was prime time to let Curly shine. The art is well done if a little unmemorable. It is really your basic kind of spooky scene. Late night, creepy house, ghosty dude, full moon. It's all there, everything you need for a good spooking. Of course there are 2 more books contained within this hardcover, even if it doesn't give you the cover art for those, let's take a peek. The second in the series gets a nice campfire scene with Curly and some skeleton scouts. No doubt they themselves are telling scary stories. Probably ones about horrible skeletons that walk around covered in disgusting flesh. Too horrible to believe! I will say that the logo/oozy border color is kind of weird. It is like... slightly greenish? And the contrast is slightly yellowish? And it sort of... blends together. Usually the colors are vastly different. It doesn't really work here. Now for the final book contained in my compilation. I picked the reprint cover to give you glimpse at a little different border. This version has a nice little picture of Curly curled up with what I assume is a spot of tea? 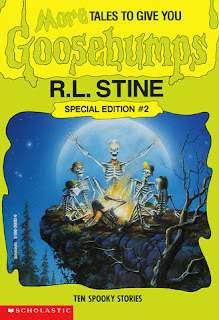 I admit the original slimey covers give me nostalgia but for an alternative this doesn't look so bad. I LOVE the cover art itself. Curly is clearly enjoying the summertime curled up with some Goosebumps in a kiddy pool. Why is there a bulldog there? Does the skeleton on the bulldog? Is it someone else's bulldog and the skeleton "borrowed" their pool? Regardless, the cover is really silly and fun. A far cry from the first books more straight laced illustration. Anyway, I think that about COVERS it. Get it? Covers? Ha ha. So after this poorly written introduction I am sure you are all chomping at the bit to get reading my reviews. Well check back each day and I shall hopefully have the latest short story review up for you to enjoy. Enjoy your October, and Happy Halloween!